Nonprofit organizations need to make smart use of social media channels to effectively engage with their current support base and find new donors and volunteers who are passionate about their cause. Learn how your organization can utilize social channels and why they are so important for nonprofits today. The new nonprofit needs a digital marketing strategy to show the world that they are making an impact. Social media is an especially important component in engaging your existing supporters and attracting new donors and volunteers. Staying on top of the latest social media trends and best practices is essential for making sure that your organization doesn’t fall through the cracks, having your mission being ignored when the proper and smart use of social channels can exponentially boost your message. The digital marketing and social media spheres have opened up whole new realms of possibility for nonprofits to engage with people who care about the causes in question. Here are some ways that nonprofit leaders and organizers can make an impact using social media. Using images on Instagram and Twitter, maintaining a YouTube channel, and posting videos to Facebook are ways that organizations can draw attention to themselves. For nonprofits specifically, donors want to know what exactly their money is going to and what would compel them to donate their time as well. Use these channels to directly show the public what their money supports: who/what is benefiting as a result of that support? How does the community benefit? Why would these actions make someone feel good for donating or showing up to volunteer? This is critical for getting sustaining donors who will support your organization over the long term and not just send a donation during holiday appeals. No amount of budget reports and mailings will achieve this unless you literally show people how their donations are being used in video and image, and what an impact their donations have made. Twitter, Facebook, Pinterest, and other social channels are excellent opportunities for finding people who are passionate about your case. Whether targeting users organically or running a paid traffic campaign (note that paying for traffic is not the same as paying for fake followers! ), your social media manager can create campaigns that are as broad or extremely targeted as necessary. If your organization is resource-rich and well-known, running a social campaign based on keywords or a newsworthy event can be effective. Common attributes among donors, like income level, interests, and other demographics can also be highly effective. For smaller organizations, like community and civic groups that have a local angle, social campaigns can be narrowed down based on geographic region all the way from zip codes to entire states in addition to utilizing keywords and demographic attributes. Running a webinar or virtual roundtable is made straightforward and free using Google Hangouts, Snapchat, and other channels like Facetime and Periscope to engage with supporters and attract new ones. 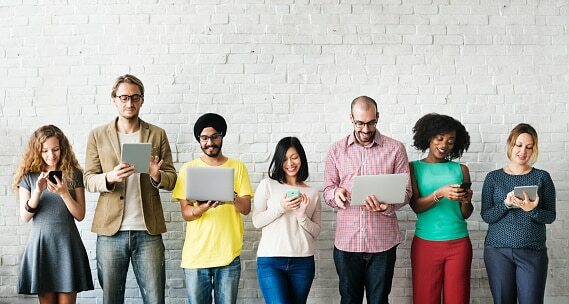 Video chat is highly underutilized in the nonprofit sector and needs to be embraced more because people want to see more than just an appeal to get their money or their time: use just a half-hour Snapchat session to connect with thousands of visitors around the globe to talk about why your organization’s cause is so important. A more private Google Hangouts session that offers more hands-on discussion can be an effective time investment for getting future financial support, but even more, the talent that can assist your organization with its mission. Video chat will bring out more engaged supporters who are doing more than simply watching a video or reading an email campaign. A beneficial aspect of digital marketing, social media included, is that social analytics can be easily measured to determine which campaign was effective and which one was not. It can be hard to tell if an appeal letter had an impact but if a YouTube video had several thousand views that led to your website and subsequently resulted in many donations, you’d know that your message was made clear. Analyze your social campaigns and content for their impact and determine why they did or did not result in success. Success also may not necessarily mean donations: was your goal to increase awareness of the issue at hand by seeing many shares, retweets, and so on? To get email subscribers? Volunteers? Keep an eye on how much traffic and impact each campaign generated, and don’t forget to do A/B testing to see which image, wording, or other factors will get the best results from your supporters. Social channels are an excellent resource for nonprofits that should not go underutilized. They provide an efficient method for engaging with existing supporters and garnering new ones and cultivating a significant social media presence, and the following can also prove to be helpful when seeking large amounts of funding through grants or private foundations. Social media is also a very public-facing means of contact that literally shows the world how your team conducts itself and approaches the cause supported. Nonprofits need to make smart use of social media by forming cohesive campaigns that align with a specific goal and refining them based on the results that they generate.